Out with the old and in with the new now applies to economic metrics. Among the disruptions caused by the digital economy, gross domestic product (GDP) needs to make room for more accurate approaches, according to just-published research examining the value of digital goods and services. The research paper, written by MIT IDE Director, Erik Brynjolfsson, MIT Sloan’s Avinash Collis, and Felix Eggers of the University of Groningen, focuses on the shortcomings of GDP to measure intangibles, and how this relates to consumer well-being. Throughout the 20th century, GDP has successfully measured production and prices, according to Brynjolfsson, but it wasn’t intended to measure well-being or welfare, especially, when goods and services are free. How Much is Facebook Worth to You? For instance, the economic value of Facebook, music streaming, or Wikipedia, is ignored by GDP because they have very low or no costs, equating to zero value. However, the research shows that gains in social welfare — well-being, satisfaction, and improvements to daily living — can be measured, potentially adding value to the digital economy as a whole. The authors propose a unique way of directly measuring consumer well-being using massive online choice experiments. This methodology assigns a dollar value to the free digital goods people use by asking them how much it would take to relinquish the products for a period of time. Using this approach, Facebook is worth about $40 to $50 per month for U.S. consumers, according to a series of surveys the researchers conducted. In Europe, digital maps on phones are valued at 59 euros (currently about $67) per month. And the free messaging tool WhatsApp, is worth fully 536 euros ($611) per month, the survey indicates. “The magnitude of the numbers was really striking,” says Collis, a doctoral candidate in information technologies at the MIT Sloan School of Management, who helped develop the new study. The researchers used three large-scale online surveys in which consumers were asked to put a price tag on the free online services they consume. In many cases, respondents were asked whether they would prefer to keep using a free online good, or to name a price that would compensate for losing access to that product. The surveys drew about 65,000 responses. “The best way to value these digital goods is to go to people directly and ask them,” Collis says. Looking at consumer surplus –the difference between the amount consumers are willing to pay for a good or service and the amount that they actually pay — would probably be a more accurate metric for digital goods, according to the authors. That doesn’t mean the demise of GDP, Brynjolfsson says. 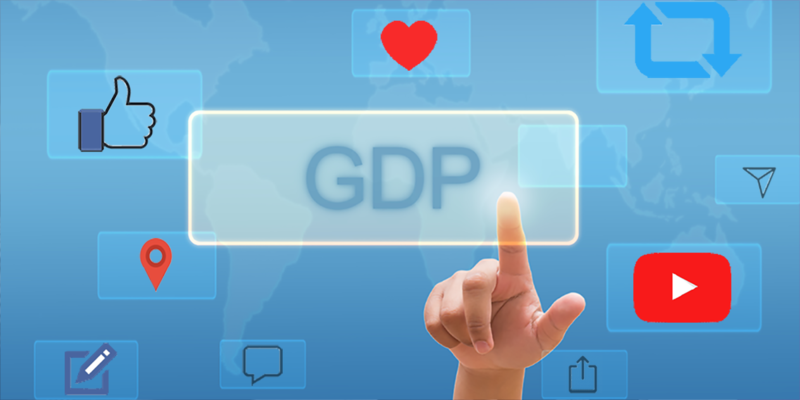 “GDP is still a valid measure of production, but we also need to more precisely measure the benefits we get from digital goods and services.” Going forward, policymakers and economists who want to understand growth trends need a complete view of the market. In addition, new metrics may help businesses develop dashboards for investment purposes and for new product development. “When data isn’t being captured, it’s not part of the conversation. We want to change that,” Brynjolfsson says. Among the limitations to their results, the researchers say that given their sample size of about 80,000 people they can only provide relatively coarse estimates of changes in consumer surplus. Additionally, the choice experiments were only accessible online, and therefore, they excluded around 11% of the U.S. population not using the internet at all. Read the full research paper, Using Massive Online Choice Experiments to Measure Changes in Well-being,. For more, go to the MIT News site here, and the press release, here.